The Favourite offers a deliciously saucy taste of court intrigue set in 18th century England. The film, directed by Yorgos Lanthimos (The Lobster), and written by Deborah Davis and Tony McNamara, opens November 30 in the Bay Area. Queen Anne (Olivia Coleman) is the often-ill ruler of England. She can’t eat sugar and suffers from a bad case of gout. She is child-like, both in neediness and, some might say, in her intelligence. She has Lady Sarah (Rachel Weisz) handling her affairs of state, which include making unpopular decisions about taxing landowners to raise money to fight a war in France. When Sarah’s cousin, Abigail (Emma Stone), a Lady who has lost her station in life, arrives one day seeking employment, she gets a job in the scullery. Abigail meets Queen Anne when she craftily gets past a guard and applies a salve to the Queen’s bad legs. The Queen is impressed and gives Abigail more responsibility. Abigail, pleased with her new role, remains loyal to Sarah—especially when Harley (Nicholas Hoult), the leader of the opposition party, tries to get Abigail to help him in court affairs. Part of the joy of the film is the salty language, some of it anachronistic. But it is also amusing to see these bewigged Brits behaving badly. A throwaway gag has a bunch of men pelting a naked man with fruit to almost everyone’s amusement. As Sarah and Abigail bond on the shooting range, there are some humorous incidents that result involving gunplay. Moreover, each of the three female leads gets a scene where they vomit, albeit comically. The Favourite is not concerned with being proper. The games of love and revenge that take place—including blackmail—are actually quite cruel, but also darkly funny. (A clever running gag has Abigail being literally pushed around by Harley). Lady Sarah insists that she loves Queen Anne because she can tell her highness when her makeup makes her look like a badger. “I will not lie to you. That is love,” she explains. They also bond while taking a mud bath together. However, Lady Sarah is also trying to get Queen Anne to remove Abigail from the household in order to maintain her own favored position. Likewise, Abigail contrives marriage to Masham (Joe Alwyn), in order to secure a title and remain in the household. Whether her sexual desires are more for Queen Anne or for Masham (or both or neither) is left for viewers to puzzle out. Lanthimos does give audiences equal parts of sumptuousness and debauchery. The film may not work as an allegory, in the way that some of the director’s other films do, but never mind. The costumes are fabulous, and the film features stunning art direction and set design. Some scenes are shot entirely in candlelight, while others employ a wide-angle lens to distort the image. The cinematography is exquisite as characters are followed down long hallways, or into huge rooms. Every shot is like a painting come to life. The period music is also wonderful. 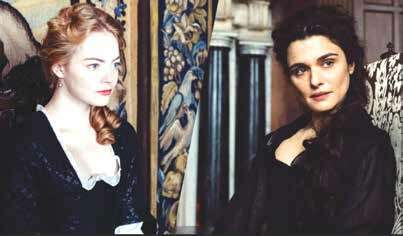 But it is the plot and the performances that make The Favourite so enjoyable. The dialogue is often arch and witty, with some terrific put-downs and wry innuendos. Lady Sarah is especially tart-tongued, and Weisz is marvelously feisty in the role. The actress is also hilarious in her physical moments, too. A dance sequence that features moves both funnier and far removed from the typical 18th century ball is the film’s comic highlight. Likewise, Emma Stone is delightful as the conniving Abigail. Stone is a master of withering looks, most notably in an outrageous sequence involving her in bed with Masham one night. 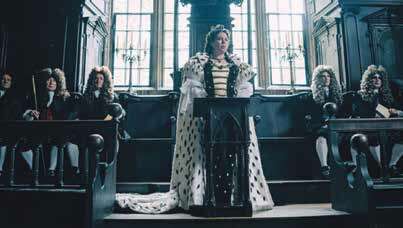 In support, Olivia Coleman is terrific as Queen Anne, a royal who is incredibly insecure. Coleman has a skill for making her character honorable and horrible, often at the same time. 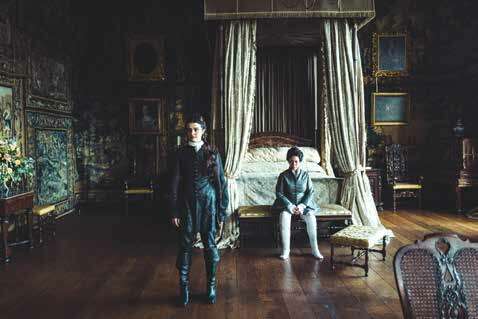 The Favourite is decadent fun.